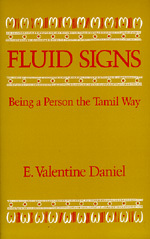 Fluid Signs is the product of anthropological fieldwork carried out among Tamil-speaking villagers in a Hindu village in Southern India. Combining a richness of ethnographic detail with a challenging and innovative theoretical analysis, Daniel argues that symbolic anthropologists have yet to appreciate the multifaceted function of the sign and its role in the creation of culture. This provocative study underscores the need for Western intellectual traditions in general and anthropology in particular to deepen its discourse with South Asian cultural and religious thought. E. Valentine Daniel is Professor of Anthropology at the University of Michigan and coeditor of Culture/Contexture (California, 1995).